What if you could have the promise of the Skully or the new BMW HUD helmet in a lid you already own? Here’s a company trying to do just that. Like the Nu-Viz Motorcycle Heads-Up-Display, the DigiLens is a separate system that you add on to a motorcycle helmet you already own. This is nice in that a) it keeps the price of the unit down, b) it let’s you use a helmet that fits, and c) it keeps tech companies from having to dive into the helmet research, design, testing, and manufacturing world. Unlike the Nu-Viz, which attaches to the outside of the helmet, the DigiLens attaches to the inside via a magnetic strip (yes, it’s unclear what it’s supposed to attach to). 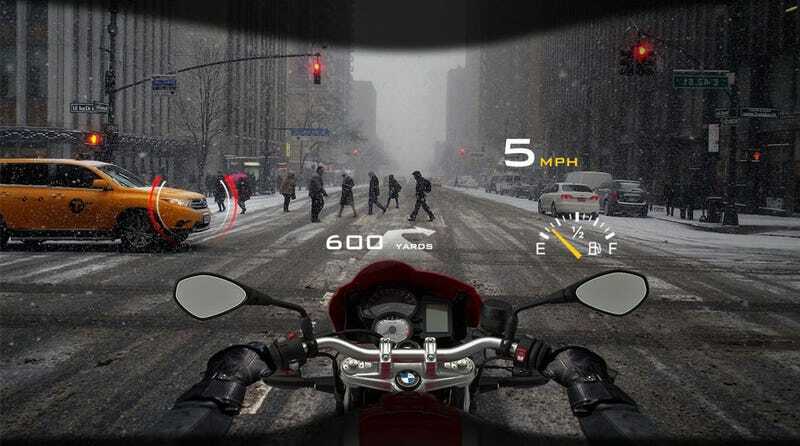 Like the BMW HUD helmet, it places a clear screen directly in front of the right eye, which provides information via GPS sensors, a bluetooth connection to your phone, and a 360-degree camera. Mashable got ahold of DigiLens founder and CEO, Jonathan Waldern, who confirmed that the software is all written in Unity 3D, which is based on the Qualcomm Snapdragon and Android platform. Waldern also says that the batteries last up to six hours, and are hot swappable so you can change out one said and then the other without the HUD stopping. This looks to be the same unit in the BMW HUD helmet, and the Mashable article states that the unit won’t go on sale until 2017, but was at demonstrated at CES this last week at the BMW Motorrad simulator. The graphics provided do appear slightly different, but that’s likely just in the layout of the visuals presented to the rider. There is still no real information on how the screen would attach, nor a front or rear facing camera, so look for more info on this as it comes closer to production. In the mean time, you can watch this absolutely horrendous video of how the BMW HUD helmet in action. Well, allegedly. Because I don’t know how a screen that covers one eye fills the whole visor. Or that a buddy’s call will be able to update your route automatically. And I certainly hope the internal speakers know how to play something besides Hoobastank.